Though it is easily missed by those driving on Route 8A today, Chickley Alp was once a major ski area in Massachusetts. John and Josephine Basciano purchased land in early 1937 and developed lift served skiing for the 1937-38 season, when a 1,400 foot rope tow was installed at Chickley Alp. The lift may have debuted on December 19, 1937. For the 1938-39 season, Chickley Alp added a ski jump and toboggan slide to its winter sports offerings. In addition, a much longer trail, Hawks-Joch Run, was available to those willing to hike to the summit of Hawks Mountain. While the ski area only had two rope tows in 1941-42 it was quickly becoming jam packed with skiers throughout the region. As a result, it quickly grew to seven lifts by the time the 1947-48 season rolled around. Included in the tally of lifts was a bi-directional flat rope tow called the "chow line," which transported skiers between the warming hut and snack bar. Part of the draw to Chickley Alp during its heyday was the popularity of snow trains. With passenger trains delivering skiers from all around to nearby Charlemont, Chickley Alp had convenient long distance transportation in the days before the Interstate Highway System. On such snow train passenger was Arthur Parker, who would become inspired to develop Thunder Mountain ski club near the train tracks. Thunder Mountain would later grow to become Berkshire East. Joe Graham took over the ski area during the 1950s, maintaining it as a surface lift only ski area. As larger areas started to sprout up with chairlifts and snowmaking, Chickley started to fade. The Hartford Courant even went as far to say that Graham 'opened the area at his convenience with complete disregard to the time, or to how many skiers might be waiting. Skiers were often compelled to supply gasoline for the car engines that were used to power the tows. Everett and Anna Peabody purchased the ski area from Graham prior to the 1959-60 season and tried to repair Chickley's facilities (down to 4 rope tows by 1961) and reputation. In April of 1964, the Peabodys sold the area to Richard G. Desmarais. Desmarais would add a new T-Bar to the area for the 1967-68 season, replacing an aging rope tow. 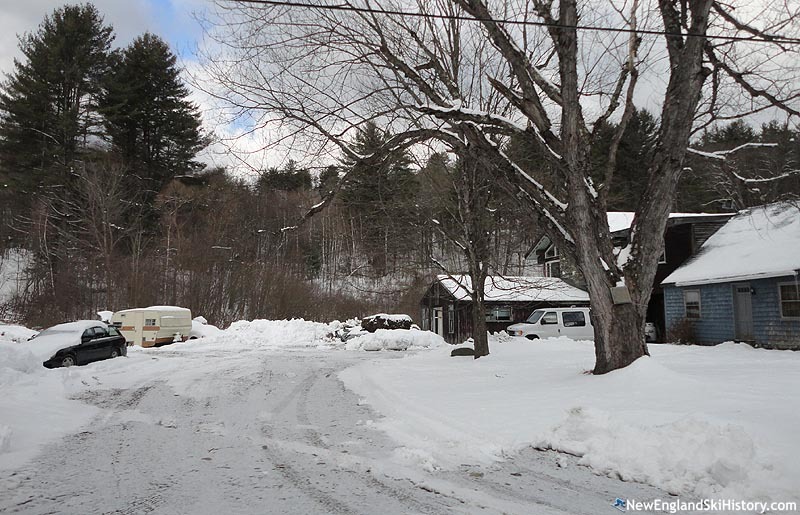 The ski area ran into a series of financial problems during the 1970s, facing both mortgage and tax debt issues. Due to the financial issues, as well as a snow drought, it's unlikely that Chickley Alp operated for more than a year or two in the early 1980s. While much of the ski equipment was still on site in 1985, the salvageable goods were eventually sold, including the T-Bar. Richard Desmarais passed away on Christmas Eve 2012. 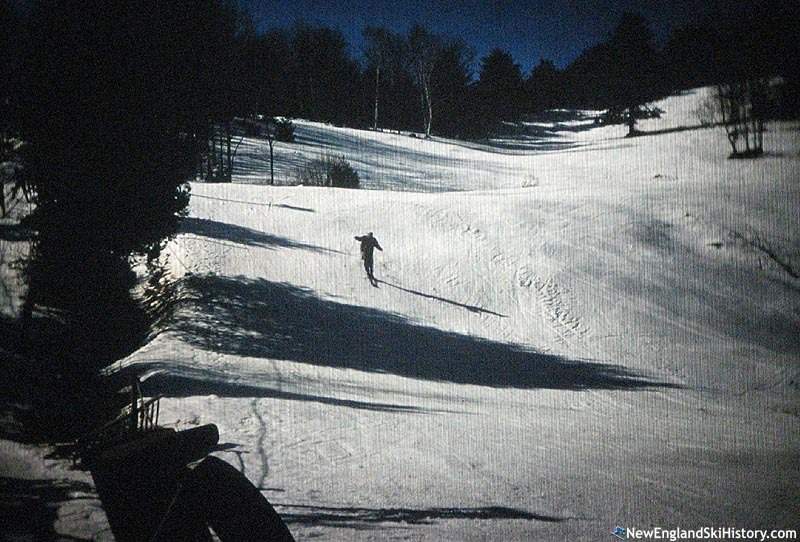 "In 1970 on an overcast Friday night in January, the Chicopee Comp ski team drove to Chickley Alp to spend the night as the guests of the Desmarais family, in the small lodge with practice planned for the next day. The room in which we stayed was 14' x 16' at best, warmed with a wood stove. This was an event! Being in the mountains, staying on the mountain in the dead of winter was too good to be true. For me, it would not have been any better at a high mountain lodge in the best of Vermont. The following morning we were surprised by 8 inches of new snow and the bluest of blue skies and the promise of a surprisingly warm day ahead. I wandered out to the base of the rope tow to find the operator, a pleasing older gentleman with a pipe anchored in his teeth who looked as though he might have come to help out between milkings at a nearby farm. He was using a broom to sweep the new snow off of a 3' wide x 4'long x 2'deep, unpainted upside down plywood box which covered an engine which was in its rightful place on the frame of a long since unroadworthy truck. All that remained of the truck which was backed up to the hill was a completely rust covered frame, was a straight-6 motor with the spark plugs on its top, a 2 foot long shifter protruding from the transmission and a large cold steel wheel with the 1-2' thick ropetow rope wound three times around. With the snow cleared and the box removed, the key was turned, the motor started quickly, the shifter shoved into gear and with the turning of the wheel our means of transport up the mountain was complete. I share this story with my children and their spouses and I will soon be sharing it with my grandchildren with fond regards of an simpler time. I have since skied everywhere with great enjoyment but little compares to the pleasure of a 400 foot vertical mountain under the clearest skies, with fresh snow and no lift (tow) lines, knowing I was experiencing skiing as it was meant to be." "Was looking at a map and Chickley A. came to mind. 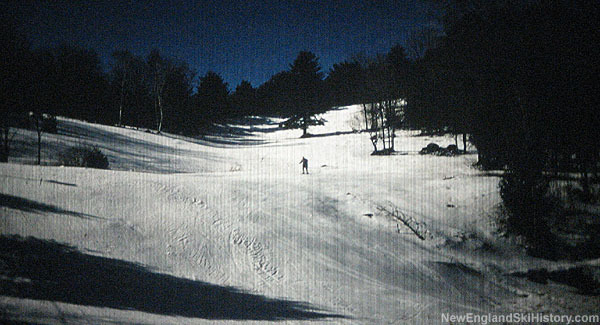 We lived in Granby Mass and spent many wonderful days skiing my age at that time 8 to 15. My mother broke her leg there but the pictures show she was still having a good time." "I skied there once or twice...in the early or mid 60's. It was a nice little get-away for some of us city slickers who were not able to go as far as Vermont, etc..Does anyone remember Eddie Goulet who was an instructor at Chickley? " "Our family skied at Chickey Alps in the late 60's. I fondly remember the T-Bar lift we wrestled with. I recently found a 'Chickley Alps' patch meant to be sewn onto a ski jacket. I've proudly affixed it to my golfing jacket as a memento of my youth." "My family along with two other families, the Wheelers, the Jacksons, and the Marshalls skied here from 1969 to the mid 70's. We were 10 kids in all. The adults stayed upstairs in the lodge with picnic baskets and thermoses of soup and hot chocolate. Lift tickets were about 6 dollars, stapled onto your jacket. I would get private lessons from Mr. Morton if he wasn't busy. I got be be quite an accomplished skier thanks to his pointers and eventually went off to college in Vt. where I still live. I remember an older man at the T bar, but I can't recall his name. My father used to like to go out and lend a hand loading. Does anyone remember Leo, head of the ski school? Mr. Desmaris kindly let our 3 families sleep downstairs in the lodge in our sleeping bags on several occasions. (We all had long drives back home). Their daughter Donna would join us, as she was close in age to us. I remember one of the sons Steve ran the rental shop.North Trail and South Trail were for experts. They ran along side the T Bar. I used to love those narrow chutes. The best was the big wide dip that landed you in front of the lodge for all to see.So many fond memories.Jane (Wheeler) Williams"